In the past few years, I’ve had a housekeeper off and on again. I’m tempted to write a list of my reasoning for hiring someone to help clean my house, but I’m not going to and I don’t think you should have to explain yourself either. We do not need to be martyrs! We all have to find the balance in our lives that works for us. Cleaning is important. I know there are a million feel-good quotes out there about how sticky floors make for better moms and blah blah, but in my experience, sticky floors attract ants. Toilets that don’t get cleaned regularly are not sanitary. I don’t want to bathe my toddler in a dirty bath tub. Floors are the #1 place for germs to find their ways inside our homes. Our shoes walk all over the grocery store, streets, and public bathrooms, and then walk right back into our homes. Kitchens that aren’t cleaned can grow dangerous bacteria. Dust makes it hard for our children to breathe, and we can get sick from dirty pillowcases and dirty toothbrushes. I just don’t know how to sugar-coat this for you: cleaning is important. Coming home to a totally clean house is a thrill that never gets old. Having a housekeeper, especially a good one, is such an amazing gift. I have high expectations of how my housekeeper will spend her time and the quality of her work, but there are lots of things I must do first to let her do her job properly. Discuss specific expectations with any housekeeper you hire, but here are common expectations: Housekeepers are not in charge of organizing and tidying your belongings, picking up toys or dirty clothes off the floor. They dust around the junk on your surfaces, they aren’t responsible for putting that junk away. Counters, dressers, desks, and surfaces should be clear so that the housekeeper can CLEAN. Cleaning and Organizing are two different things. Also, there are some house cleaning chores that are difficult and time-consuming. I suggest arranging with your cleaner to rotate through deep cleaning chores like I suggest for those cleaning their own homes. If you disrupt the routine and ask your cleaner to do one or more difficult jobs that are unplanned, offer compensation for the work! I expect my housekeeper to do all the regular cleaning tasks like bathrooms, dusting, floors, trashes, and changing sheets. One of the best parts of having a housekeeper is the motivation it gives to get the house tidy. It is a deadline to actually getting stuff put away! It can be a lot of work preparing for the housekeeper to come, but definitely worth the effort. 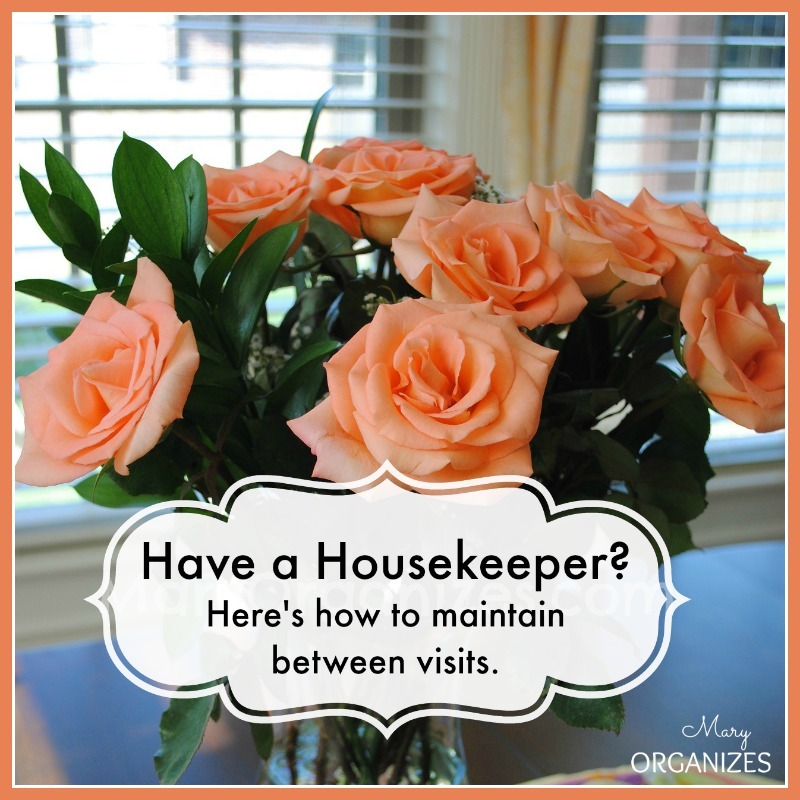 What I want to share with you is my method for maintaining our homes in between our housekeepers visits. I want to help you avoid that crazy mad rush right before she comes! I recommend adapting the same cleaning schedule as someone doing all the cleaning themselves. There are a number of places on the blog where I discuss cleaning schedules, though the most notable is one of my most popular posts How To Keep A Perfectly Clean House … or something like that.. Of course there is a cleaning schedule printed in my Home Management Planners, which is very convenient. Basically – you follow the same schedule, you just skip the deep cleaning aspects. On Bathroom day, you go to your bathrooms and tidy them up. On Floors day, you make sure everything is picked up off the floors. On Dusting day, you make sure all of your surfaces are cleared off. On Kitchen day, you make sure your kitchen is tidy and clear of junk. You get the idea … right? YOU are still responsible for the cleanliness of your house!! You are just delegating some of the specific jobs to your housekeeper. Keeping your home maintained and tidy in between cleanings will help you avoid the last minute stress AND make the most of your investment. Okay, tell me: do you have a housekeeper? Yes I have a housekeeper and do not feel guilty for it. I say no to a trip to a restaurant or new shirt but I love love love coming home from a play group to a clean house. I love having a regular deadline to get my house tidy and organized but hopefully can maintain it and make it less of a night before rush. Yes, best thing I ever did. I have cut back to every other week but like you said motivation for keeping things tidy and picked up. The motivation is one of the best perks! Yes I do. She comes every 2 weeks. Helps me keep the house looking good and allows me to be with my family on the weekends. Yes, we have a lady who comes every other Friday. She knows if the door to a room is closed, then a bomb went off in it & it’s too untidy to clean. My niece has her lady come every week and just do the common areas of the house, with each person being responsible for their own bedroom. Both of us swear it saved our marriages. Amen! I tell that to anyone I hear complaining about their wives/husbands cleaning of their house … I always ask “can you afford a housekeeper?” It takes so much pressure off of the marriage when things are hectic! I am a housekeeper and the people that I work for do you not understand that I am not in charge of organizing their junk in it aggravates me because when they come in from work and see that I have not organized anything they can attitude with me. I have told him over and over I am not there made and I will not pick up after them. How do I get it through their heads what they should expect of a housekeeper?? It is a business relationship, so you need to have good professional communication with them and set your boundaries. Let them know that areas that aren’t tidied will not be cleaned … or you could let them know there will be an extra charge for you tidying and then cleaning those areas. They are paying you, they are your clients, but if the job is not worth it for you that you are cursing them under your breath, you aren’t doing them any favors to hold onto that frustration. So work it out in a professional way or move on. 🙂 Just my 2 cents. I am starting a new business and have been looking around for ideas to “set myself apart.” Certainly, a housekeeper must do the job well and be efficient. What are some of the fun little details that have been done to endear you to a particular housekeeper? Use natural cleaners without toxic smells. Maybe use room spray with aromatic essential oil smells. I’ve never needed a housekeeper to do anything fancy, but if she cleans everything really well, with the attention to detail I would give something myself … then I am happy. Good luck! My husband loves that our house keeper leaves the toilets blue. A little thing, but it makes him happy, so I’m happy too. That’s great. If both partners are excited about the housekeeper, that certainly helps!